Replies: 29 (Who? ), Viewed: 105432 times. #1 10th Nov 2006 at 4:13 AM Last edited by tiggerypum : 22nd Dec 2006 at 10:23 PM. There are several new issues with the Pets EP, and I will update this thread to cover the different items as they come up - giving a brief description of the issues so far found and links to the threads that further deal with the solutions. Many of these topics are primarily for the creators of custom content, although some are gameplay issues. Go get the Patch from Maxis: http://thesims2.ea.com/help/index.php?pid=Help and make new projects! If you create something with Pets Bodyshop, even a base game mesh recolor or custom mesh recolor, your recolor will not work in games without pets. Recolors made with older bodyshop WILL work in all games, including Pets. Creators can use Numenor's Legacy Bodyshop to build packages compatible with all games. There's also a link at the end for instructions on how to modify your bodyshop recolors if you already made some with pets and want to make them all-game compatible by Beosboxboy and Marvine. Custom hair and body meshes will usually package WITH your sims if you package a whole sim with pets bodyshop. Accessories (including the game glasses) have some visual bleed-through problems. A fix creators can try is found here. This might be fixed with the game patch, we can hope. Not clear why this happens, nor of a fix for creators. Reported by one that it includes standard maxis vampire teeth, not just added content. For some folks this happens every time they enter the lot. 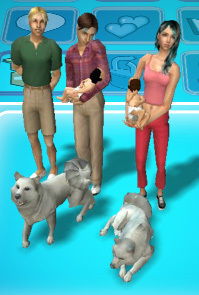 If a family is created in 'create a family/create a sim' and a dog or cat is *included* with the family, the faces of the sims in the family might lose their customizations and revert to maxis default faces when you move them in. Solution: Create your family with sims only, move them in. Then create another family with pets only, and you can move them into the lot to join your family. Sometimes floors created with multiple tiles look scrambled, here's the way to place them and have them look right! Just added the hair animations issue to the list. Thank you, tiggerypum, for the updates! It seems as though,"no_new_updates", for SimPE is a blast from the past with UNI. EA Games is beginning to irritate the masses, I won't even go into the ill-fated "BattleField 2142" and server probs. A Global following of Sims2 requires attention to detail, detail to the Modding Community that provide an annual income to EA Games and a High turnout on release dates. I would even go out on a limb and say, "If it were not for MTS2, I would not have purchased the first EP!" I am sure there are THOUSANDS of others who would echo the same statement. The Pets EP is by far 5X the headache compared to UNI, in my opinion but a big THANK YOU to all who are working on the probs. SimPE is being updated for pets, but it's still in testing, some things in the game changed format, so code has to be changed accordingly in SimPE. Maybe the game designers wouldn't see it as a "bug," but is anyone else annoyed by dogs and cats roaming freely about in your restaurants, shops, nightclubs and such? They really should have given us "no pets" signs like we had back in Unleashed. Personally I only want to see pets show up in parks and pet shops accompanied by a family member, and strays just on residential lots. Really, when was the last time your siamese or dalmation snuck out for a drink at the local singles bar? The 'no pets' signs did not come with unleashed as far as I recall, they were user-made, and you can find new ones for sims 2 pets at shaklin's site. But please, let's keep to the topic of actual bugs/problems in the game. The no pets sign was a download released by Maxis after the fact. Sorry, I didn't think my post was at all off topic, but I'll leave it alone now. Here's something I saw mentioned, and then experienced myself. We decided to take a Sim to town yesterday to buy a pet. Some of the people walking around were solid black, blue, yellow, or red. One had a missing head. lol! I have no idea what in the world could be causing such a thing. There are currently no hacks in the game. When I get my pet a job and try to click on that pets 'job' tab my game crashes. Is anyone else having this problem too? My Sim Twins don't have faces! I have a family with 2 dogs. While I noticed that the non-playing neighbor sims had no faces I ignored them bc I don't care about them. However, when my playable Mom had twins her babies were born with no faces! I was terrified and upset, lol. I am assuming this was caused by them being born with pets in the house and I had moved the dogs in with the family to this house. How do I fix this and have the babies get faces? I don't understand how the solution above about "create a family" or "CAS" can help me. #11 19th Nov 2006 at 10:55 AM Last edited by tiggerypum : 19th Nov 2006 at 12:48 PM. I hope when they turn toddlers they'll look better. Are you using a custom skintone on those sims, and have they had babies before with that skin? It's also possible that the skintone file is not right, but I am not sure how that would display. Btw, the sims don't totally lose their face in the cas/pets bug, but they lose the face changes, so they come into the game with a base face sculpt, instead of with whatever modifications you made to the face. When things like that happen to me I just work it into my game and pretend it's a congenital anomaly that is specific to Sims. Are you using a custom skintone on those sims, and have they had babies before with that skin? It's also possible that the skintone file is not right, but I am not sure how that would display. I fiddled with it a bit last night and noticed that only my downloaded custom Sims that have non-default faces work. All NPC Sims have no faces and their thumbnails looking fine (See NPC Maid snapshot below). Even in "Create a Family" only totally custom Sims have faces. I even tried redownloading and setting up a default set of faces but to no avail. I also checked if the baby gets a face when she is a toddler since both of her parents have custom faces but she is just a toddler with the same blank face. I will try to disable all custom content and see if that works before I tell Maxis bc they will likely tell me to take all custom content off. Alis, try to see if you have installed replacements for custom skins. If only maxis sims and the babies have missing heads, its more likely that something went wrong with them. I had a similar problem though my heads were white, and found out it is because I accidentaly had two sets of maxis skin replacements, that were overriding each other. Thank you very much Tiggerplum Because was going to complain about the flashing accessories (especially the Vampire fangs) my self I thought it was my nvida graphics Card and this bug is very irritating! I wish EA Would do something about it. It driving me Freaking nuts! My game has the same problem, where some NPC's have no face, just a basic face shape... I have to completely re-install my game, cause the majority of the characters have that issue, even some of my own. I was thinking it had something to do with my downloads, but I checked all of my downloads ( All of which I just redownloaded, rechecked, and categorized ) It's really bothering me too, cause it seems out of the blue. Has anyone had problems with custom game objects not working properly? Talking about objects (and not clothings etc) there can be many reasons for an older object to cease working properly, or just not getting the new Pets interactions. For example, all the cloned beds are known to prevent pets to climb on them. You should report the problem to the creator of the malfunctioning object. I don't think they're malfunctioning, the game is showing them, but as recolors of Maxis made objects. Its very odd. I just bought pets by the way, so maybe I just need to look around on my game settings. Found my problem!!! I just needed your newest CEP! Thanks for that btw, your work is awesome. Is there any way that i can put my custom content downloaded hair into one of the color categories for it? Like putting brown hair that shows up in the custom content section, into the brown hair category? I've never tried it myself, but there's a tutorial about this HERE. The tutorial mentions also the optional alternative of using the Binning Tool (a plugin for SimPE), which is the easiest way to achieve the goal. ** Patrick Stewart + Felicia Day + Bruce Campbell + zombie invasion + the cast of Firefly = my happiness.